While you can install BoldGrid on an existing WordPress installation, we also have a way for you to install it as a one click installation. This is done through the software application installer known as Softaculous. Follow along below as we go over how to get BoldGrid installed in your account using Softaculous. Click on the Softaculous Apps Installer icon located under the Software category. 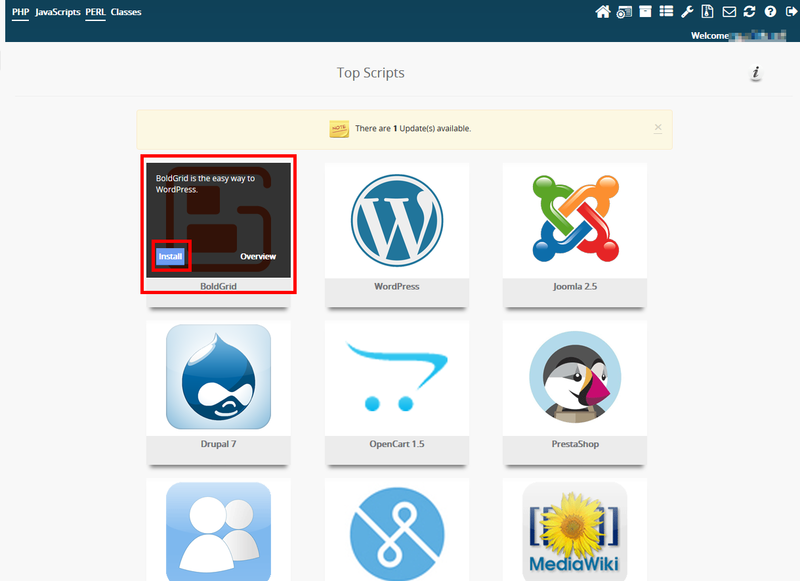 Hover over the BoldGrid icon from the main Softaculous page and click Install. Fill in the fields for Software Setup. Select the domain to which you want to install BoldGrid from the dropdown. If you want to install BoldGrid into a subfolder and not the main domain, enter the folder name here. The folder cannot yet exist as it will be created upon installation. Enter the name of your site. Example: Joe's Widgets. Enter a tagline or subtitle. Example: The best site for widgets! Checking this box will enable multisite. Leave this box unchecked for BoldGrid. Enter your Admin Account information to create the administrator account for your site. Give the admin user a name. Do NOT use 'admin'. Enter your desired password. Pay attention to the strength indicator as the password you choose must be a strength greater than 40. Enter the email address you wish to use for the admin account. Make sure it is a valid email address so you can receive information from your site. Choose the language you want to install for BoldGrid. Select the language for your site. English is set by default. Select the key box if you already have one or will be getting one from within your WordPress admin dashboard. During the install, you may be presented with an error indicating you have an htaccess file. You can either remove that file from your account manually, or select the checkbox to overwrite it and then attempt to install BoldGrid again. Once you get the message BoldGrid was installed successfully, you can log into your site and begin building! Hi, I registered an addon domain (sonyamfitzmaurice.com) to create a new website with Boldgrid, but the Boldgrid icon is not showing up on the Softaculous page in my Cpanel for the one-click install as demonstrated in this video. My main website (smfalittlesomething.com) is active, created with the now dinosaur Frontpage. My plan is to build the new Wordpress site and then point both domains to the new one when finished. Will this work? This article may be premature in that all servers may not yet have the BoldGrid icon. They will soon, if not. As for your question about rebuilding the site and pointing the domains, yes, that will work.